Nestled between verdant rain forest and white-sand beaches on a private island, The St. Regis Maldives Vommuli Resort overlooks the alluring waves of the Indian Ocean. 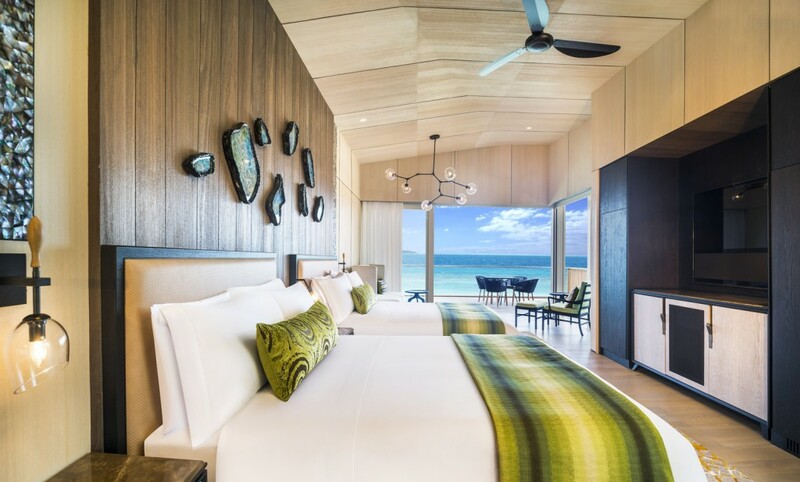 Boasting refined furnishings and island-inspired design, each of the 33 on-land and 44 overwater villas promise picturesque ocean or garden views from private terraces and pools. 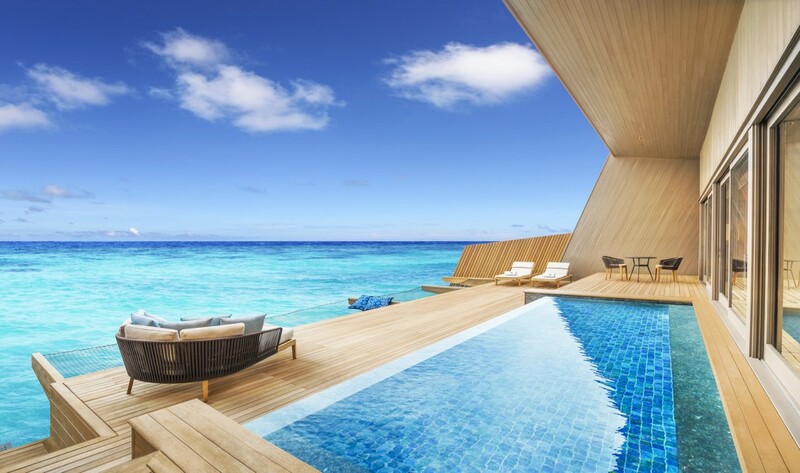 Explore the tropical beauty and rich marine life of this peaceful, eco-conscious setting. Savor sophisticated cuisine in any of six restaurants and bars, relax by the infinity pool, restore well-being at Iridium Spa or maintain your workout regime in the Exercise Room and Yoga Studio. 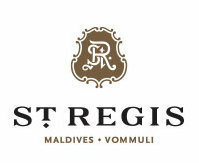 Set to redefine ‘Barefoot Luxury’, guests’ personal St. Regis Butlers ensure that unique preferences are known and understood in great detail. No request is too small or unattainable to fulfill at any hour. 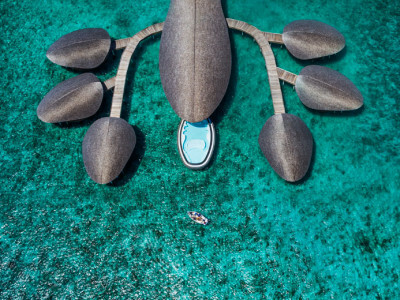 Two-Bedroom FamilyVilla with Pool On the ground floor, a terrace features a 15-square-meter plunge pool as well as a plush daybed, sun loungers, and a dining table with seating for four, providing a welcoming place to gather and reconnect. 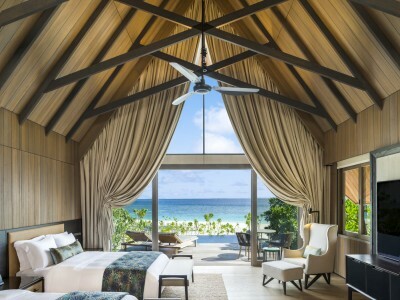 The bedroom features a vertical ceiling and light wood floor with a backdrop of peerless ocean vistas. 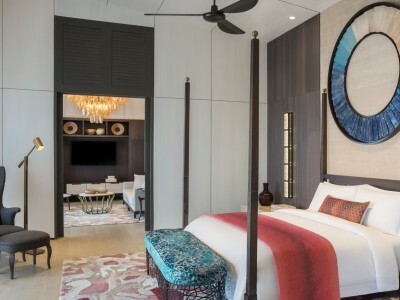 An iridescent turquoise art piece, two side tables, and a cream-colored settee frame the signature king-size St. Regis Bed, which offers direct access to the private outdoor plunge pool. 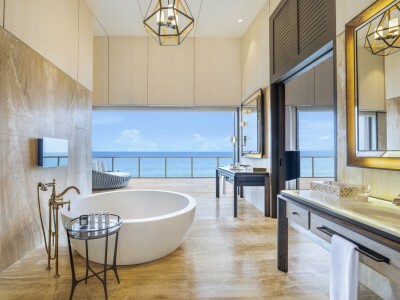 Adjacent to the bedroom, the marble-clad bathroom features a glass-enclosed rainforest shower, separate deep soaking bathtub with Remède amenities, and double vanities with a 20-inch mirror-embedded LCD television. A spacious walk-in closet offers an additional amenity. 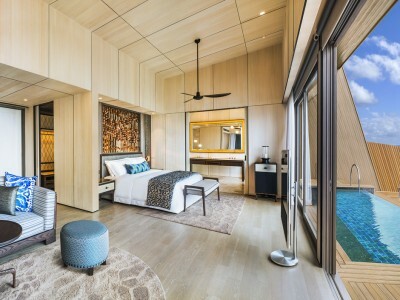 Behind the bedroom is a spacious writing desk which is outfitted for multimedia connectivity and iPad room controls offer state-of-the-art technologies. On the top floor, natural light pours in through glass doors, which open to the balcony. 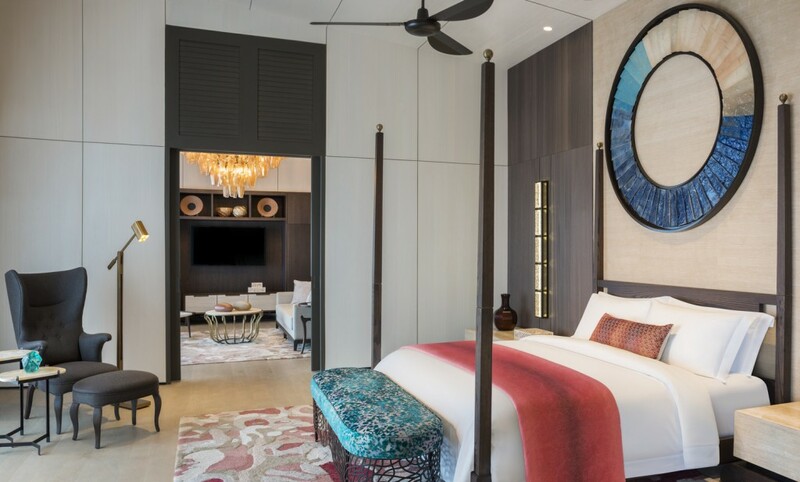 Two queen-size St. Regis signature beds, wood paneling, exquisite art, and a second 46-inch LCD television complete the bedroom. 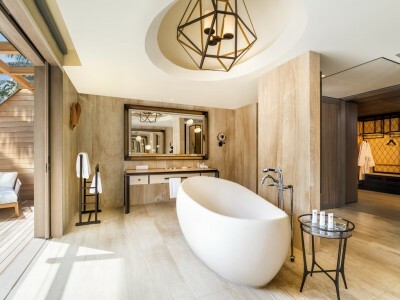 In its private bathroom, guests will find double vanities, a glass-enclosed shower, and a soaking bathtub amid marble walls. WIFI is available throughout the resort and in each guest room. 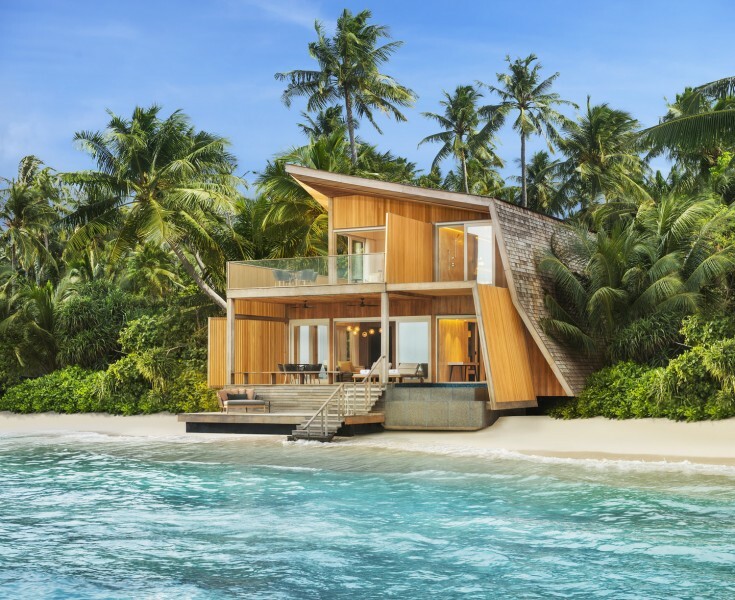 Beach Villa with Pool Revel in a dip in a private 16-meter plunge pool or settle into the sun loungers or plush daybed along the expansive wooden terrace. Refresh with a rinse in the outdoor shower with dual showerhead. 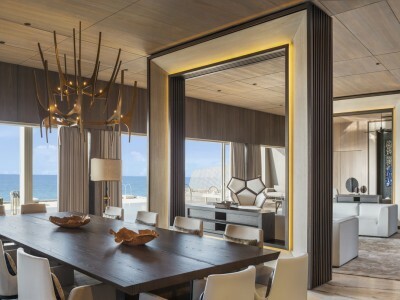 Stepping through floor-to-ceiling glass doors and into the living space, mahogany floors and ceilings complement a palette of gold, turquoise, sand, and cream. For a peaceful place to read a book, the plush sofa, ottoman, and cream armchair are awash with natural light. 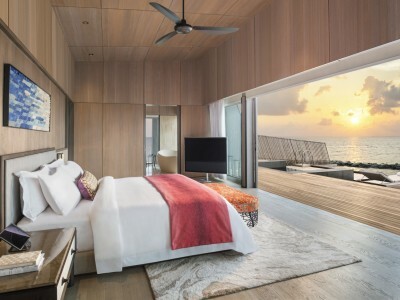 To stay connected, Wireless High Speed Internet Access is complimentary, and for added technological comforts, entertainment includes a Bang & Olufsen 46-inch LCD television and sound system as well as iPad room controls. 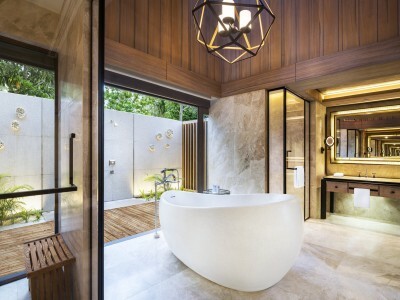 In the bathroom, a skylight and chandelier brighten the marble and timber, which are the backdrop to a glass-enclosed rainforest shower and separate soaking bathtub. Elegant double vanities are elevated by a 20-inch mirror-embedded LCD television. WIFI is available throughout the resort and in each guest room. 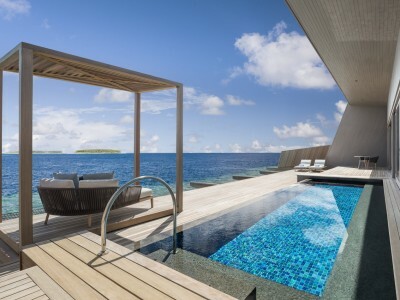 Two-Bedroom Beach Suite with Pool On the ground floor, a private furnished terrace with comfortable sun loungers and a plush daybed features a 67-square-meter private swimming pool with outdoor shower. 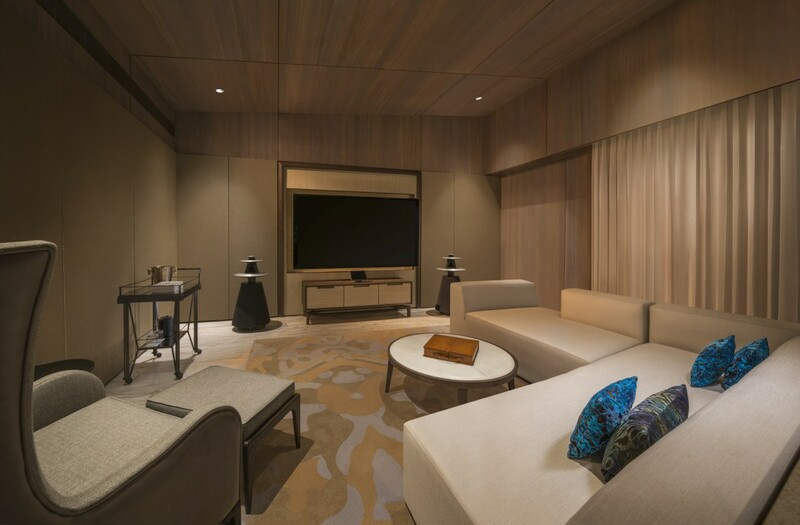 Stepping into the living room through sliding glass doors, there is a plush sofa and an armchair in which to take a restful moment. Prepare a meal for four in the fully-stocked show kitchen or share a morning meal along the breakfast bar. 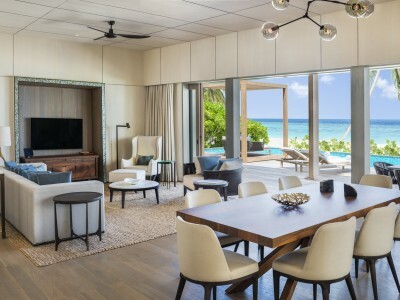 In the bedroom, a haven is revealed with vertical ceilings, wood floors, a second 55-inch LCD television and two queen-size signature St. Regis Bed. 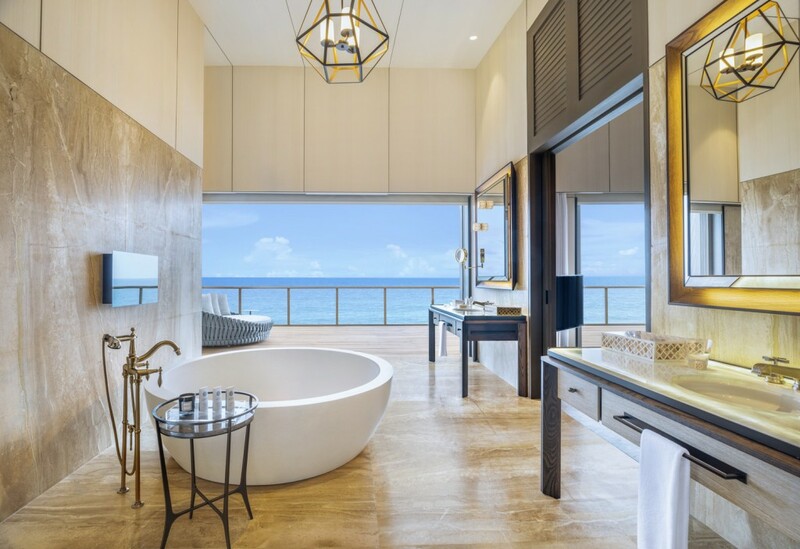 A marble bathroom—which features an enclosed rainforest shower, separate deep soaking tub, Remède amenities, and double vanities—is enhanced by a 20-inch mirror-embedded LCD television. For added convenience, there is a walk-in closet. 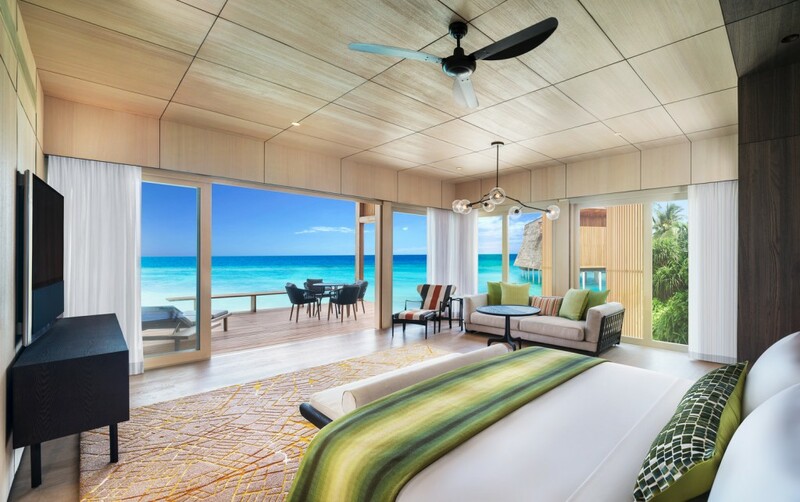 Ocean views are unmatched in the second-floor master bedroom. 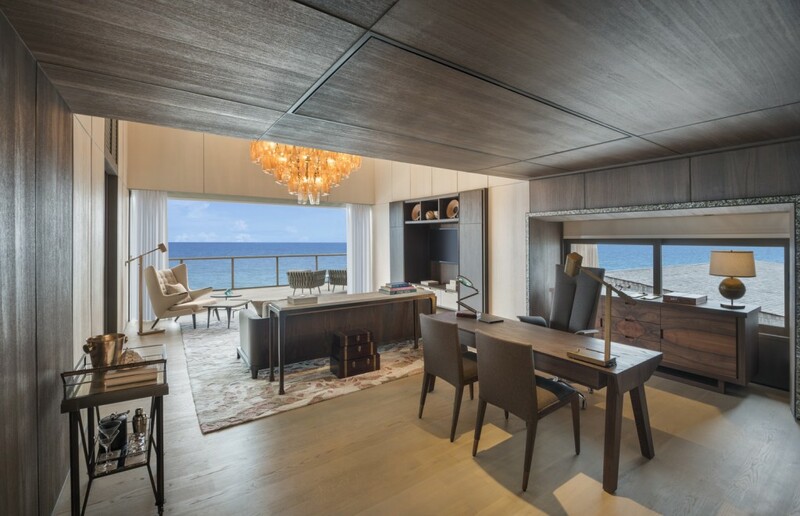 Floor-to-ceiling glass doors welcome guests out onto the balcony. 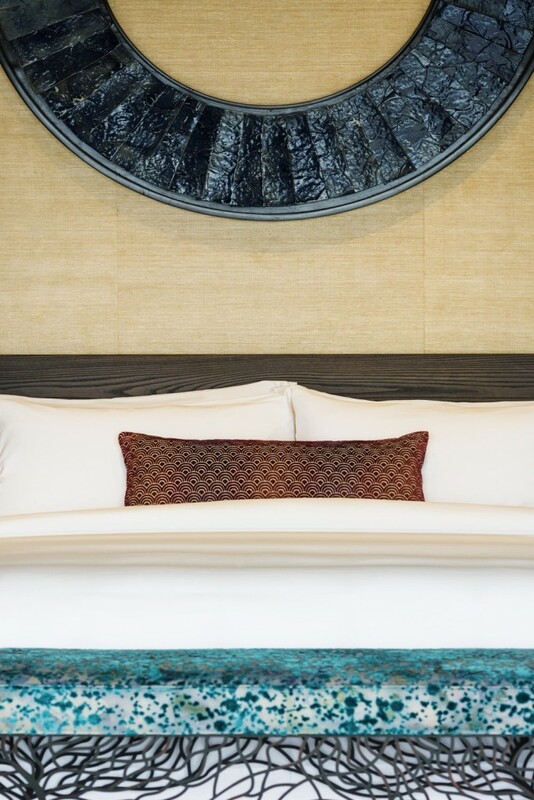 This bedroom features a regal king-size signature St. Regis Bed, a 55-inch LCD television, and elegant artwork. 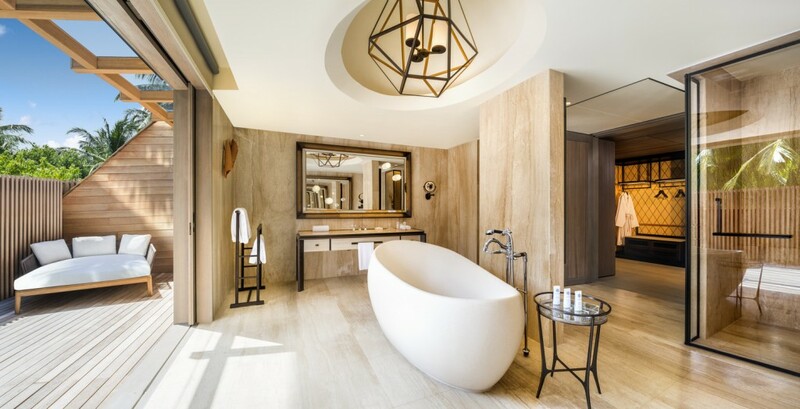 The adjacent master bathroom invites pampering with its glass-enclosed rainforest shower, double vanities, walk-in closet, and Remède bath amenities. WIFI is available throughout the resort and in each guest room. Overwater Villa with Pool Step out onto the expansive, private outdoor terrace where a 16-meter plunge pool, plush daybed, sun loungers, and four overwater hammocks offer direct access to the unforgettable azure waters of the Indian Ocean. 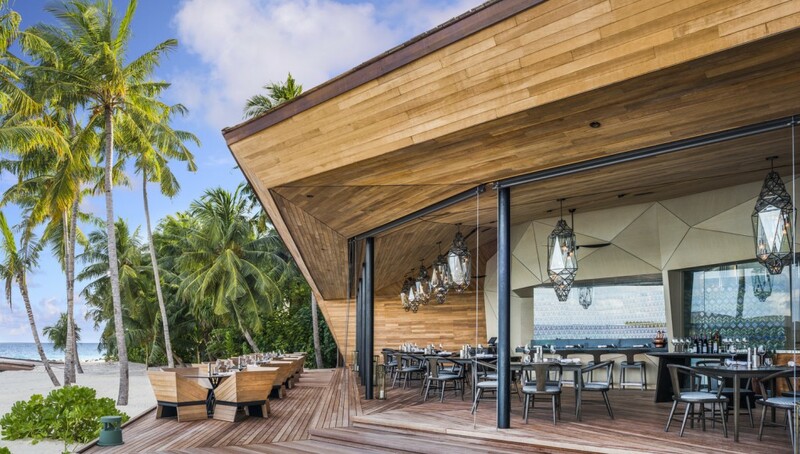 The serene Maldivian views expand into the living area through floor-to-ceiling doors and windows where the palette of green, brown, cream, cobalt, and sea-foam harken the natural elements outside. An inviting seating area features a comfortable sofa with blue and gray pillows, an ottoman, armchair, and side tables. 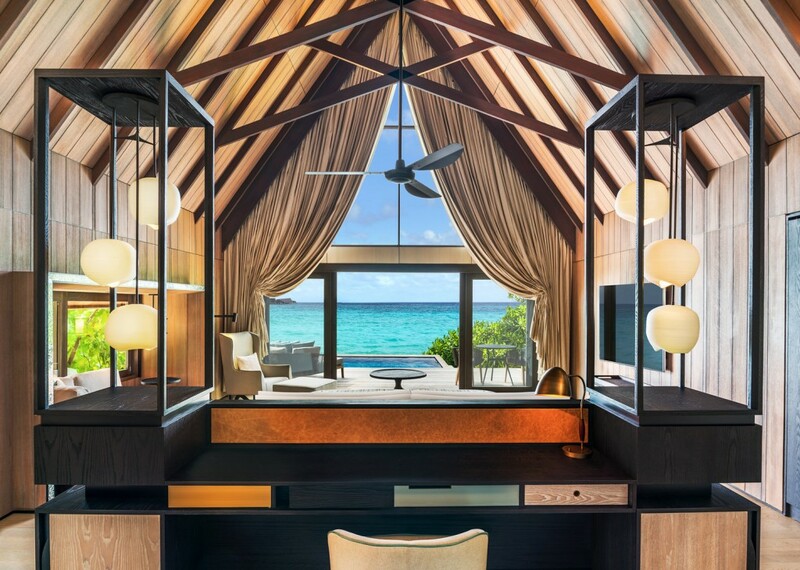 A thoughtfully appointed writing desk is complete with multimedia connectivity while the villa also enjoys state-of-the-art technology including a Bang & Olufsen 55-inch LCD television and sound system as well as iPad room controls. 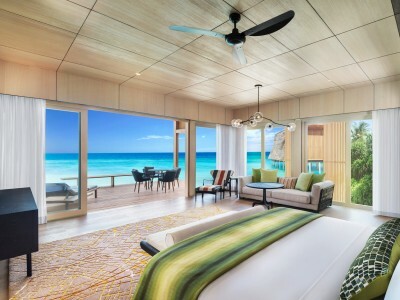 Wifi is accessible throughout the resort and in each guest room. 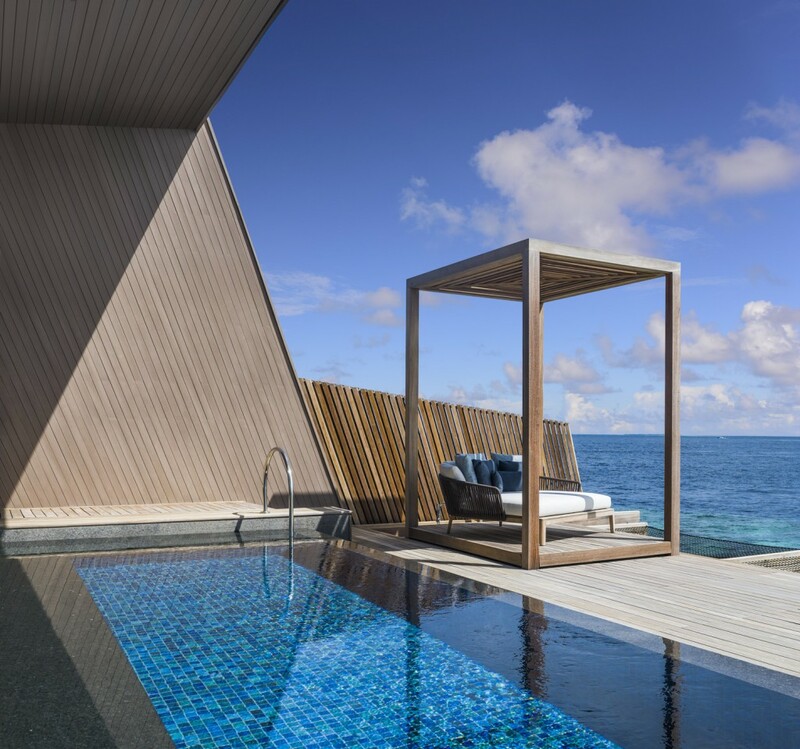 Sunset Overwater Villa with Pool Soak in the indelible views of the sunset over the Indian Ocean as it showcases different colors each day. 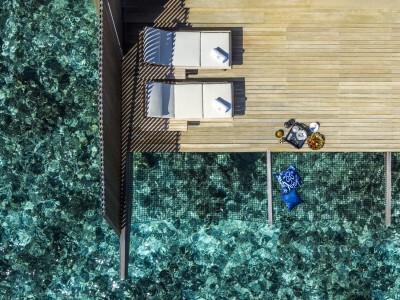 Plunge into the rich marine life under the waves just a few meters from the house reef. Find reprieve in the sitting area, which features a comfortable sofa with blue and gray pillows, an ottoman, armchair, and side tables. 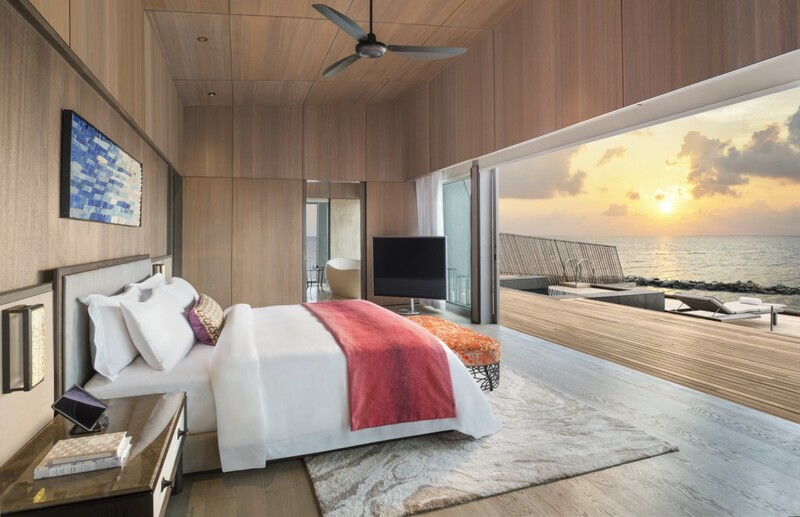 Perhaps craft an email or stay connected at the writing desk, and relish thoughtful entertainment options including a Bang & Olufsen 55-inch LCD television and sound system as well as iPad room controls. 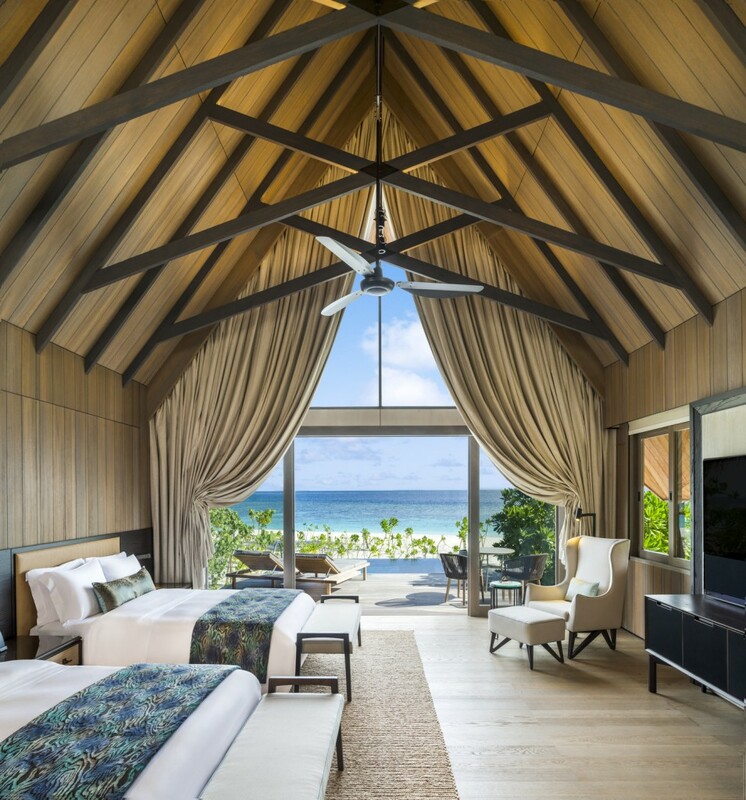 As evening approaches, enter the bedroom where ocean views, a sumptuous king-size St. Regis Bed, cream settee, a green-globe art installation, and expansive walk-in closet elevate luxury ocean living. 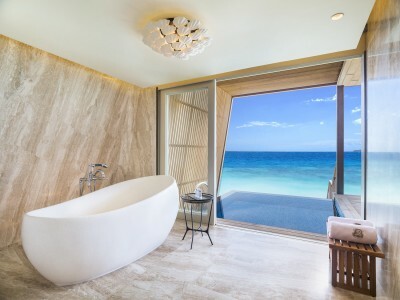 In the marble-wrapped bathroom, direct access to the wooden terrace, plunge pool and ocean is a welcome escape. 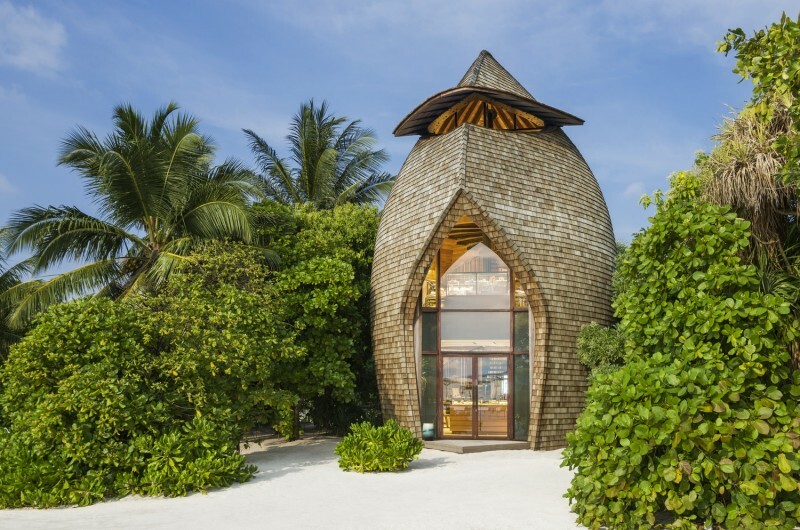 A glass-enclosed rainforest shower with separate soaking tub, Remède bath amenities, and double vanities with a 20-inch mirror-embedded LCD television afford guests supreme comforts. WIFI is available throughout the resort and in each guest room. 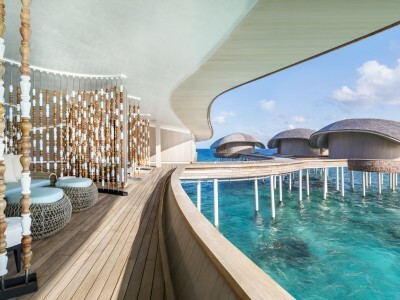 Overwater St. Regis Suite An elegant overwater retreat with stunning views of the Maldives lagoon, overwater hammocks and a romantic gazebo to take in the beauty of the house reef below. 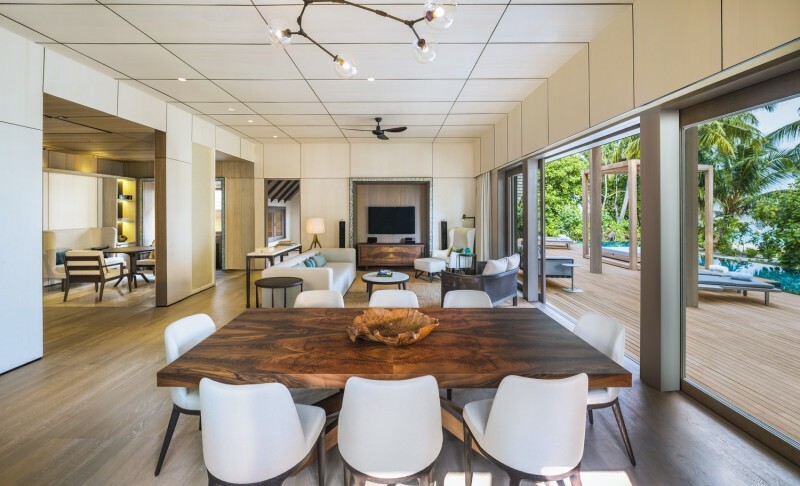 Floor-to-ceiling glass doors welcome guests into the stunning living room, which is awash with natural light and anchored by mahogany floors. A stately dining table is set for four while a powder room is situated off the living area for added convenience. 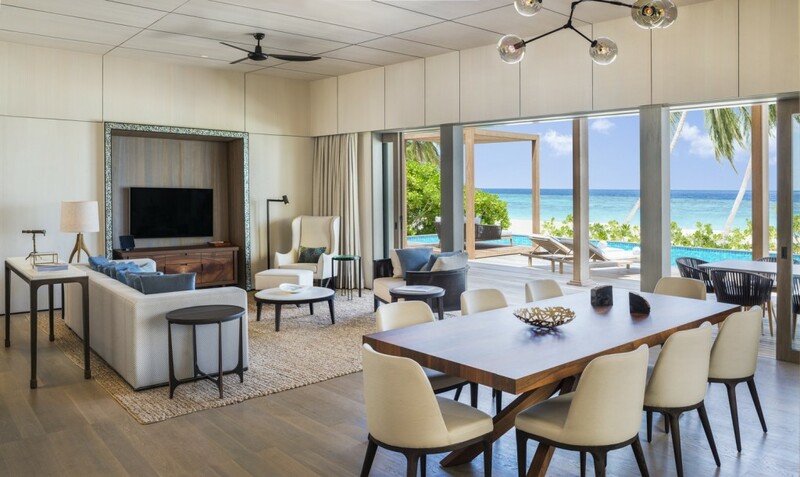 Whether for crafting an email at the writing desk or enjoying a wealth of entertainment options, this Overwater St. Regis Suite includes two Bang & Olufsen 55-inch LCD televisions and sound systems as well as iPad room controls. 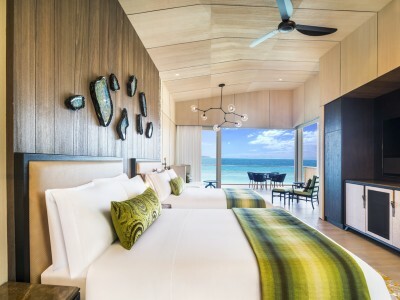 In the separate bedroom, floor-to-ceiling windows and vertical ceilings set the backdrop for the king-size St. Regis Bed, warm wood side tables, cream settee, and the green-globe art installation. A spacious walk-in closet also offers an abundance of storage. 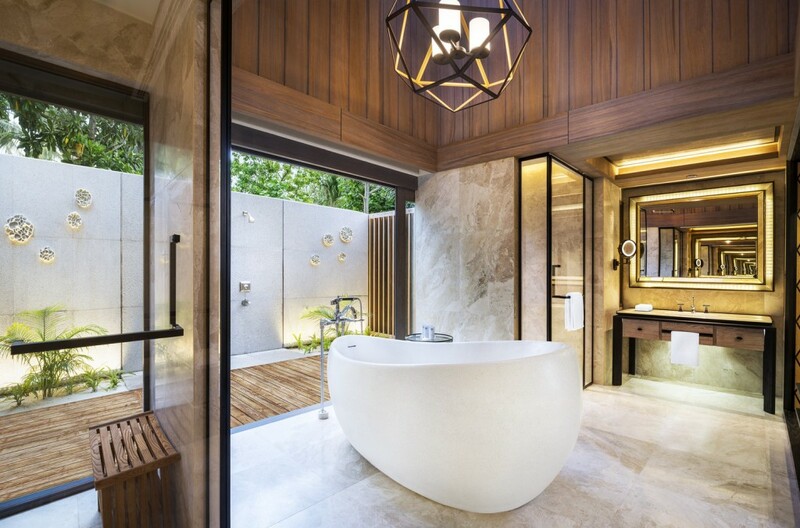 The spa-inspired bathroom is wrapped in elegant marble and crowned by a chandelier. A glass-wrapped rainforest shower, separate deep soaking bathtub with Remède amenities, and double vanities with a 20-inch mirror-embedded LCD television typify the pampering experience of this bathroom. WIFI is available throughout the resort and in each guest rooms. 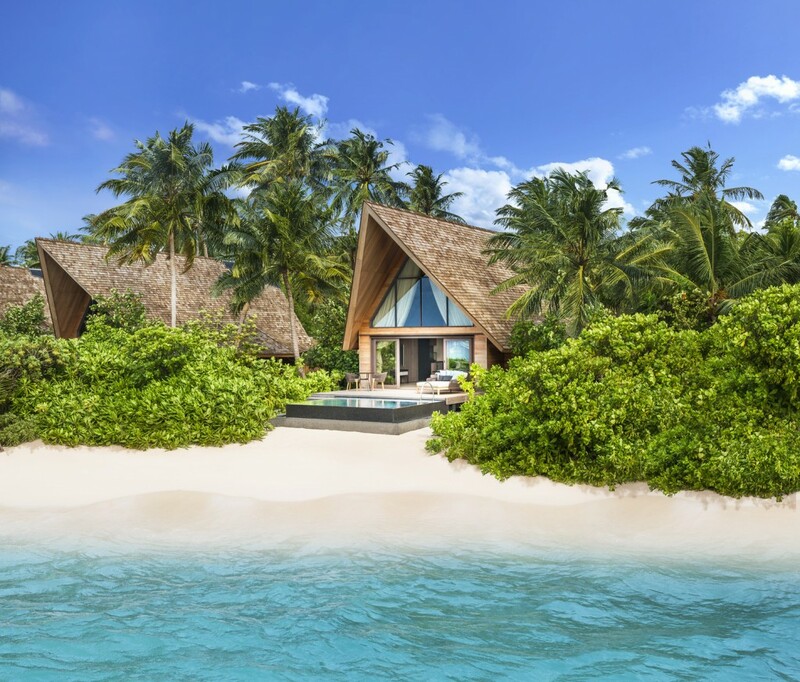 Caroline Astor Estate Ideally located at an expansive white sand beach with alluring views of the turquoise lagoon, the three-bedroom, bi-level Caroline Astor Estate is the epitome of barefoot luxury in the Maldives. 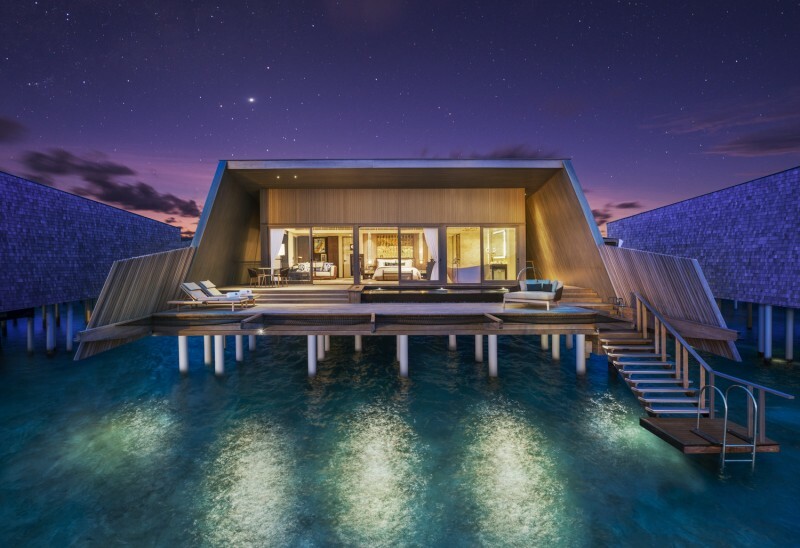 John Jacob Astor Estate – Presidential Water Villa Suite The impressive John Jacob Astor Estate stands at the pinnacle of the lagoon zone, the largest and grandest estate on the island. 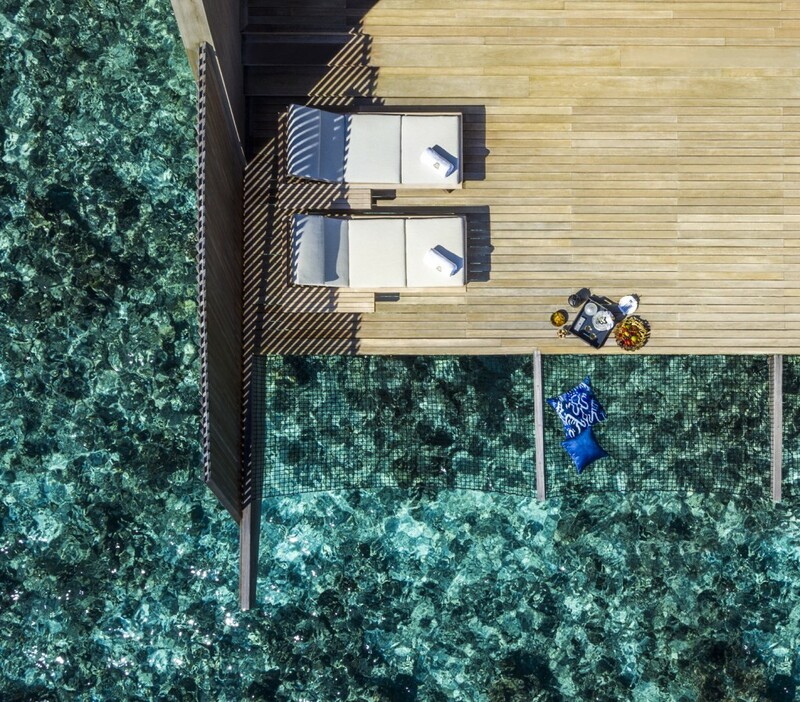 With its own buggy for exploring the island and a dedicated estate butler, it houses a 92 square meter swimming pool and Jacuzzi on its elegant minimalist deck. 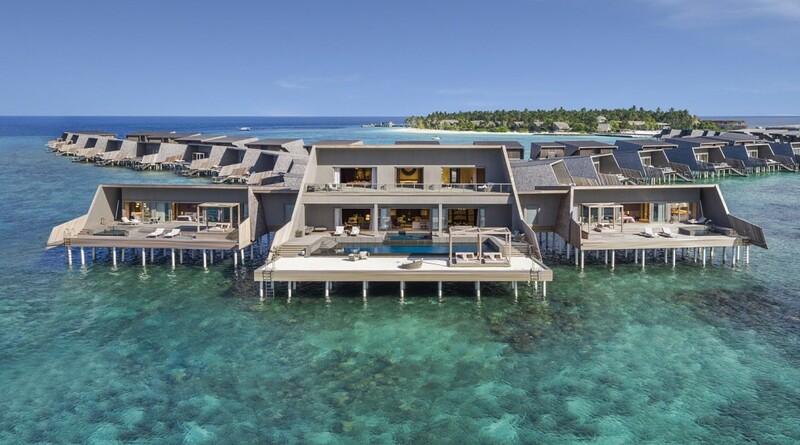 Split over two levels and with three bedrooms and bathrooms and staff quarters, it also contains exclusive luxury amenities such as a private gym, spa suites and a private cinema. 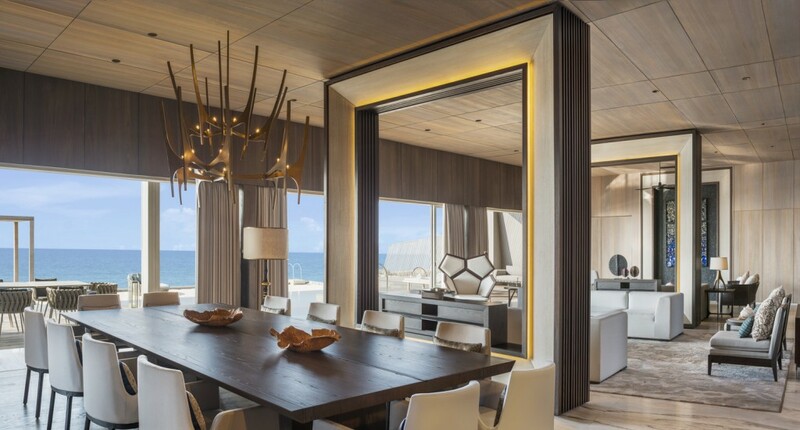 Equipped with a large kitchen – it can accommodate 12 for private dining – it boasts opulent design and unrivalled panoramic vistas. 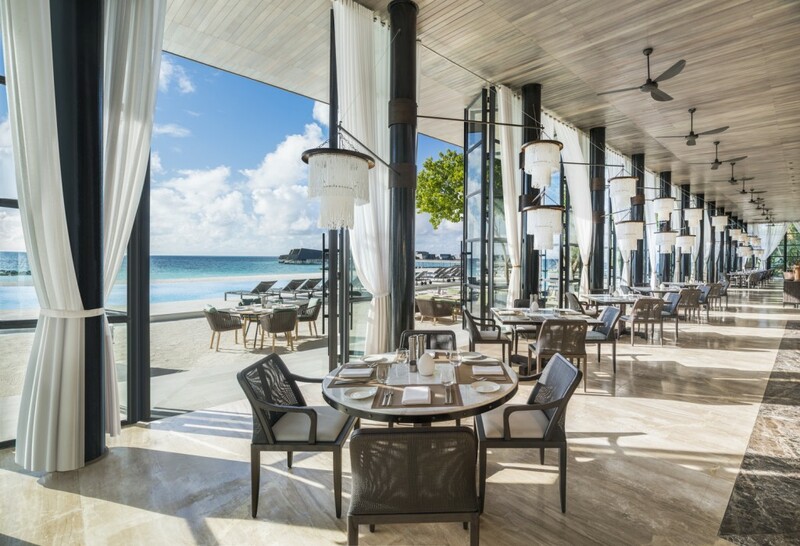 Expansive floor-to-ceiling windows with billowing curtains welcome crisp ocean breezes into Alba, an exquisitely designed, modern Italian restaurant. 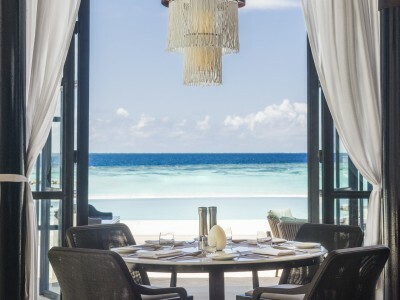 Featuring unobstructed pool and ocean views, Alba delights gourmands with a selection of freshly prepared, locally inspired dishes during breakfast, lunch, and dinner followed by dessert, including special items for children. Executive Chef Ayyoub Salameh, brings a wealth of knowledge and experience to the table in each and every inspired dish. 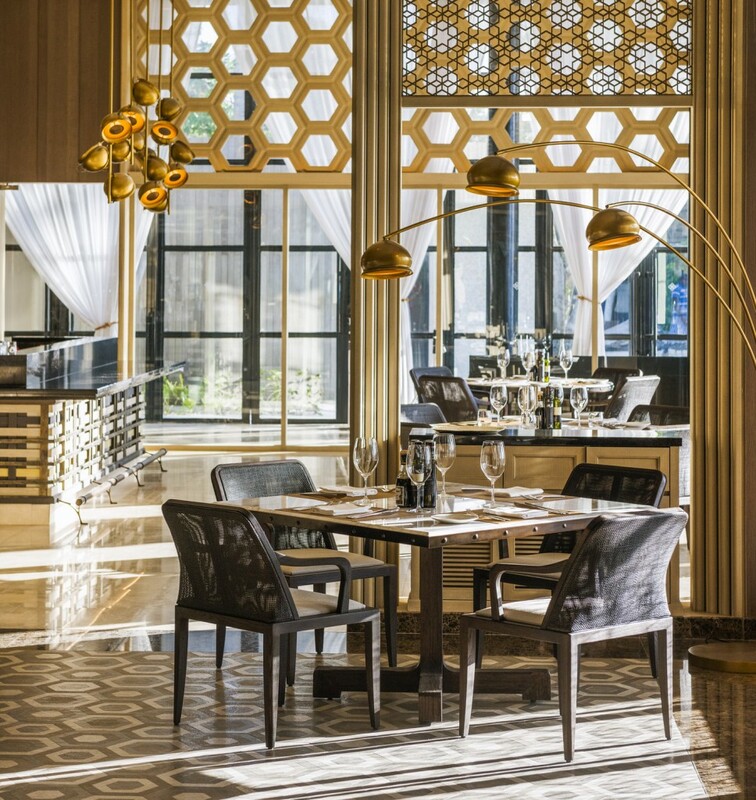 A vibrant central show kitchen, elegant bar, and separate island kitchen further the experience, while a knowledgeable sommelier is on hand to offer expert guidance on the restaurants vintages. 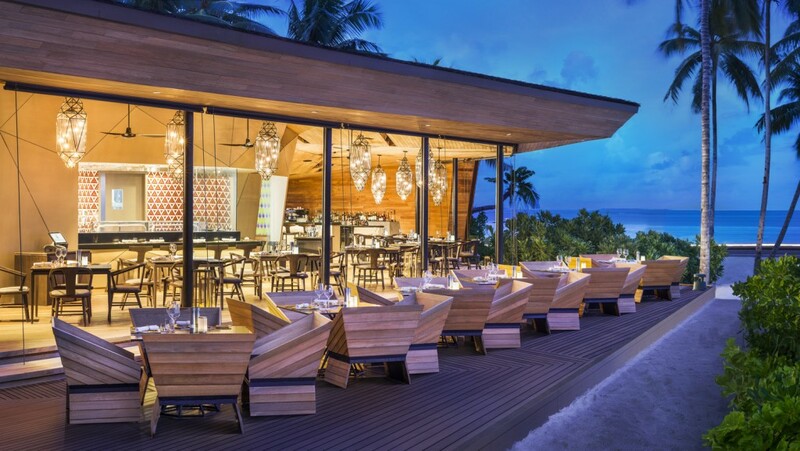 Healthy, vegetarian and gluten-free options are available to cater to dietary restrictions. 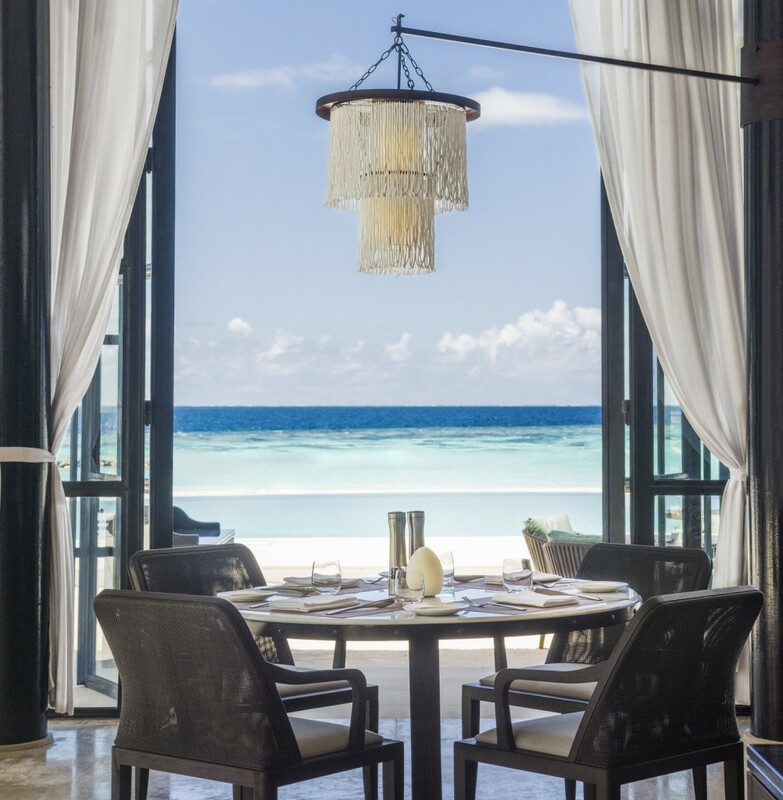 For an intimate, romantic five-course continental menu paired with the perfect wines and Champagnes, Decanter offers an elegant underground retreat. 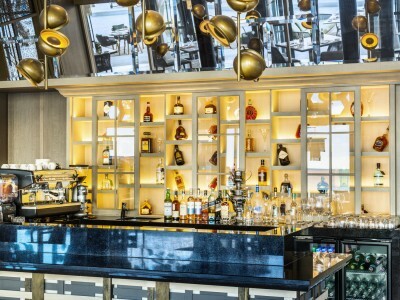 Our Executive Chef and Wine Director will craft a bespoke menu, selecting each bottle from white oak wine racks which showcase a prestigious selection of exclusive wines dating from 1755. A fine Italian marble table with seating for 12 also makes this an elegant venue for small celebrations. For a relaxed, yet sophisticated atmosphere in which to indulge in impeccably prepared a la carte-style Asian cuisine, Orientale awaits. 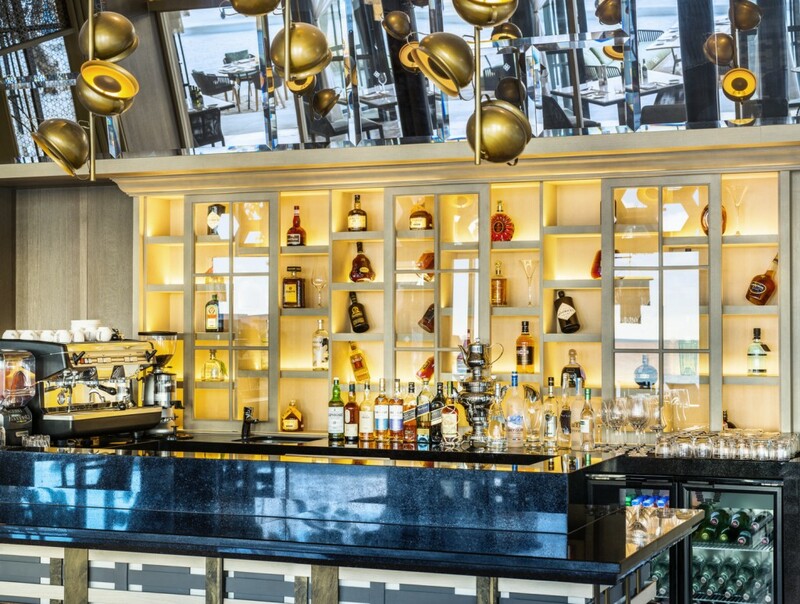 Three unique show kitchens are energized by expert chefs developing the flavors of the region—Indian and Pakistani curries and biryanis, a Japanese sushi bar, and seasonal selections of Sichuan, Cantonese, and Korean dishes fill the air with heady scents. 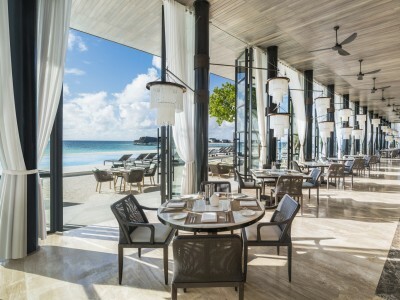 Set in the backdrop of grays and white oak and under the romantic lighting of modern black iron chandeliers, this beachfront atmosphere is an immersion into the very best of these cuisines. 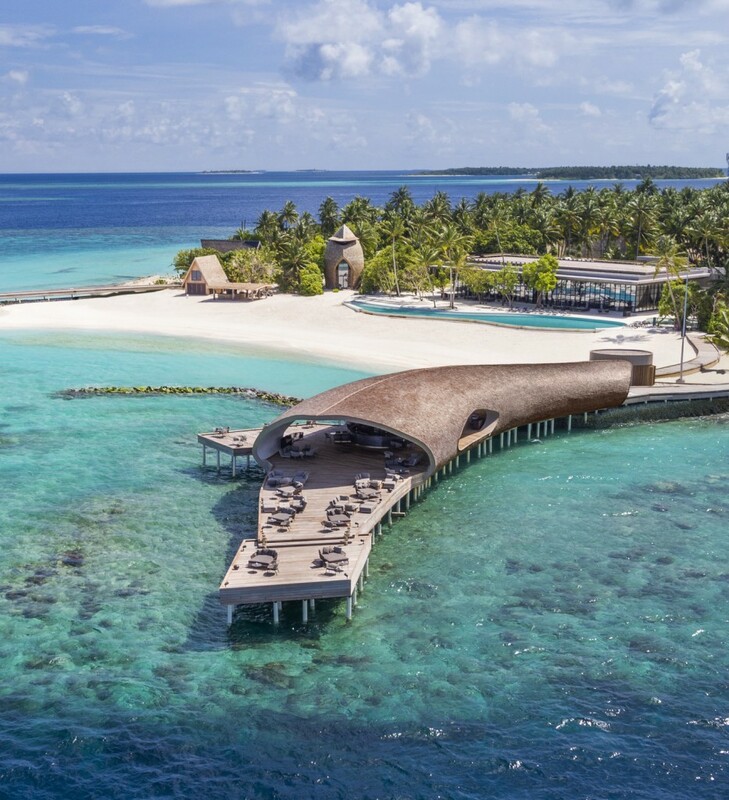 An architectural marvel emerges from the azure waters of our private coral reef, inviting guests to savor a selection of locally sourced seafood, freshly prepared tapas, wines, and spirits. 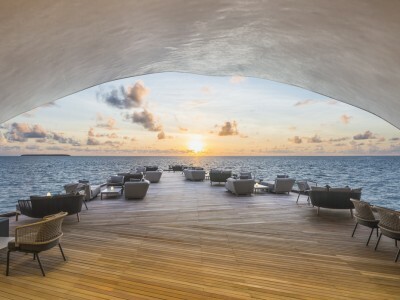 Arguably the best place to view the magnificent sunsets in the Maldives and listen to chilled music. 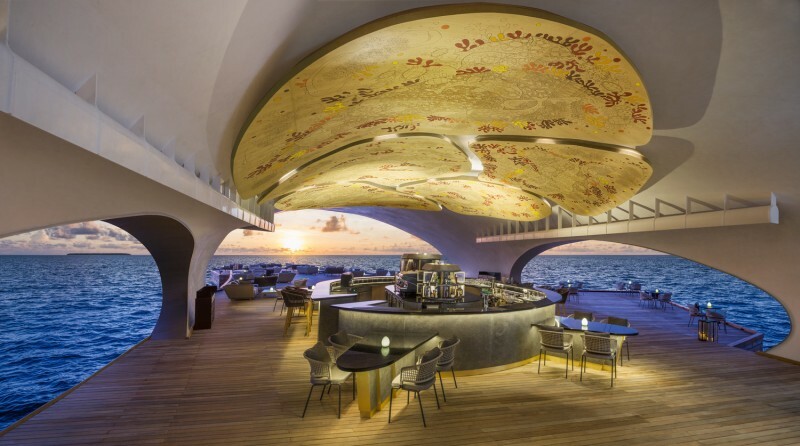 The Whale Bar is a marine-inspired destination wrapped in wood, softly lit, and adorned with a signature St. Regis ceiling mural, a sea life inspired pyrographic work designed by renowned artist Maya Burman. 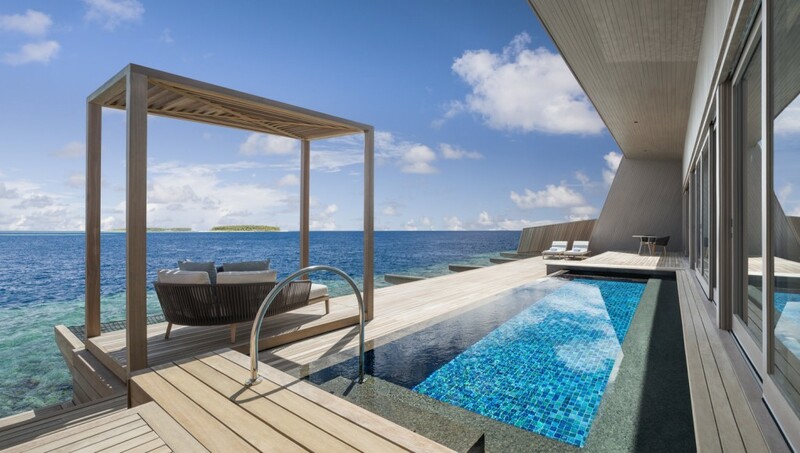 Plush sofas and armchairs invite reprieve on the open-air terrace where nature’s splendor is in every direction. 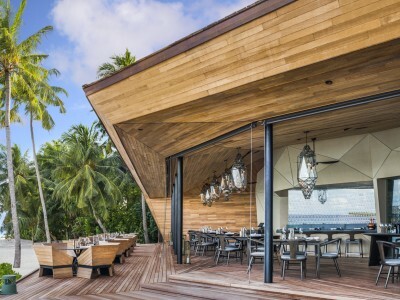 Allow Executive Chef Ayyoub Salameh to design a three or five-course tasting menu, and our expert sommeliers to recommend a libation—whether wine or craft cocktail—to sip while reveling in island vistas. 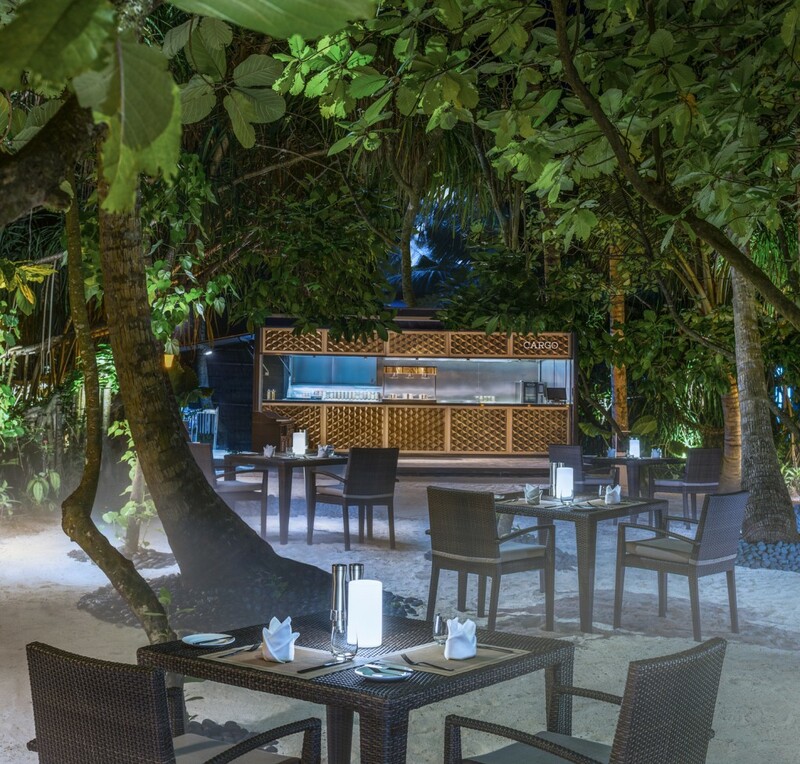 For guests seeking an alternative to beachfront dining, Cargo is the island’s idyllic destination for Middle Eastern cuisine, dine under the stars amidst dense jungle vegetation. 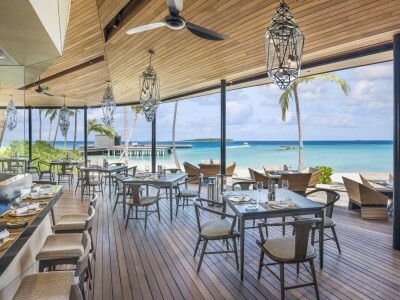 Warm ocean breeze waft into this cozy beachfront pizzeria where casual patio-style beach seating is elevated by stunning pool and ocean views. 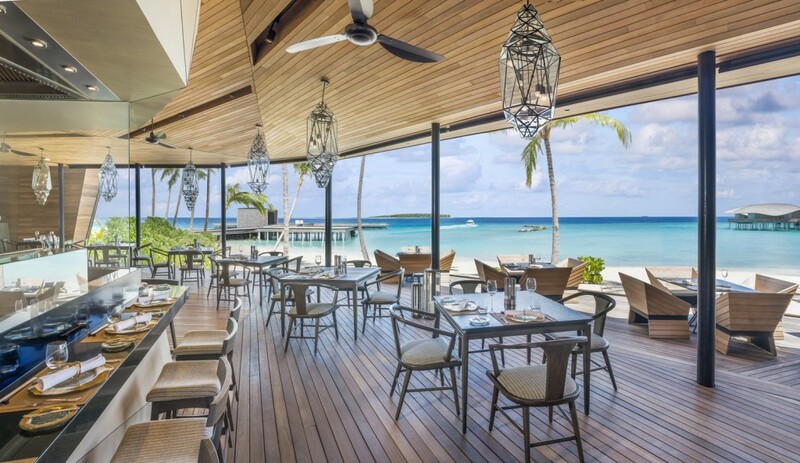 Thin-crust pizzas with inspired toppings like tandoori chicken or Maldivian tuna are cooked to perfection in the outdoor pizza oven, and sandwiches and snacks are complemented by cold draft beers and fresh juices. 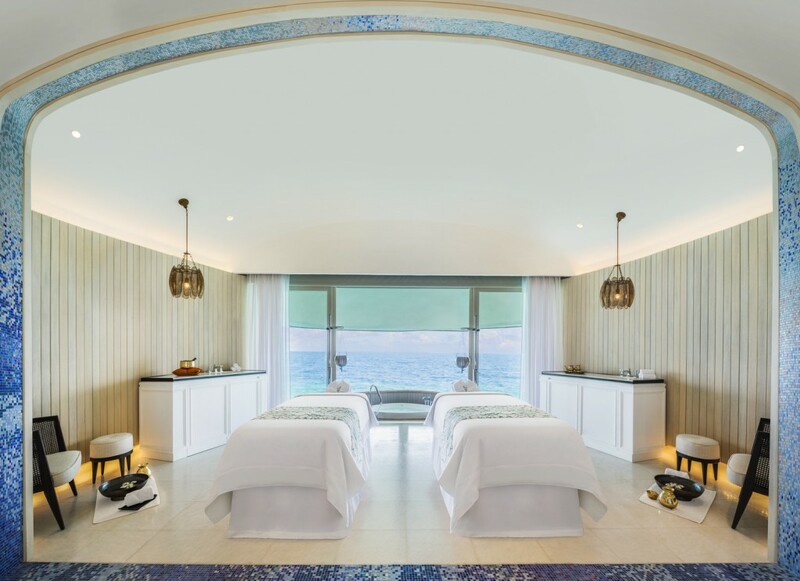 Our signature Iridium Spa promises a transformative journey in an oasis of tropically inspired sophistication. 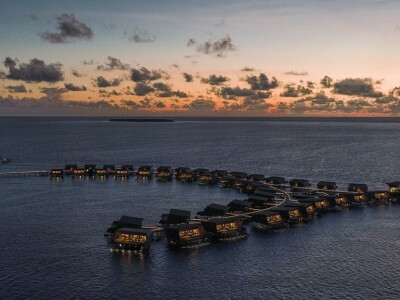 Alighting atop the scintillating waves of the Indian Ocean, our 1,850-square-meter overwater sanctuary features plush furnishings set against white oak interiors to create an ambiance of elegant tranquility. 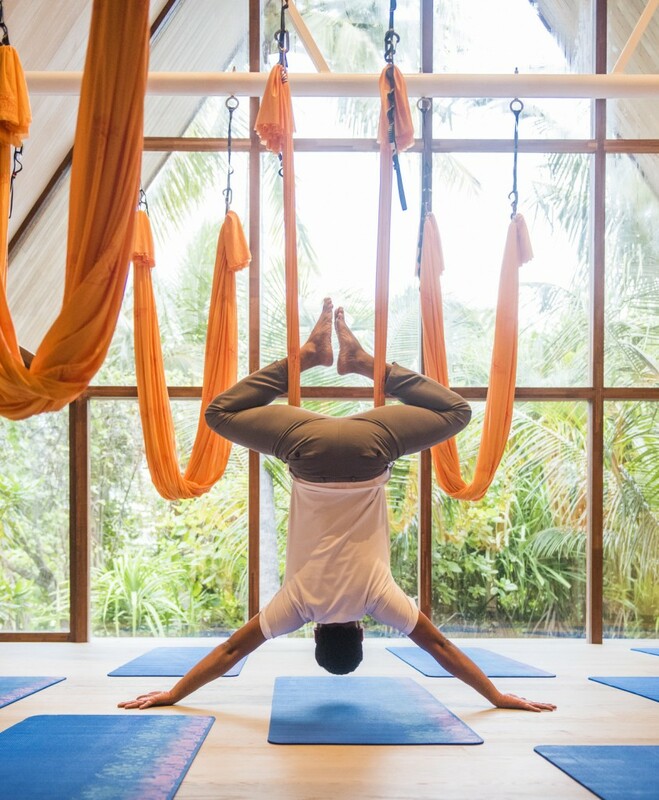 Each of our six couple’s treatment suites—including two Ayurvedic suites with private steam rooms—offer a refined retreat. 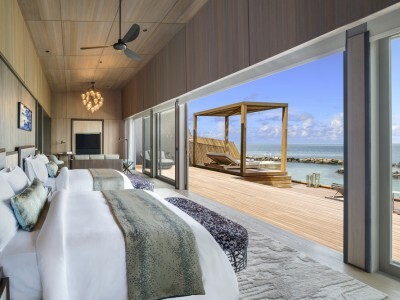 Sliding-glass doors allow guests to admire unfettered sea vistas from their spa beds while private terraces with soaking bathtubs ensure relaxation enhanced by fresh ocean breezes. 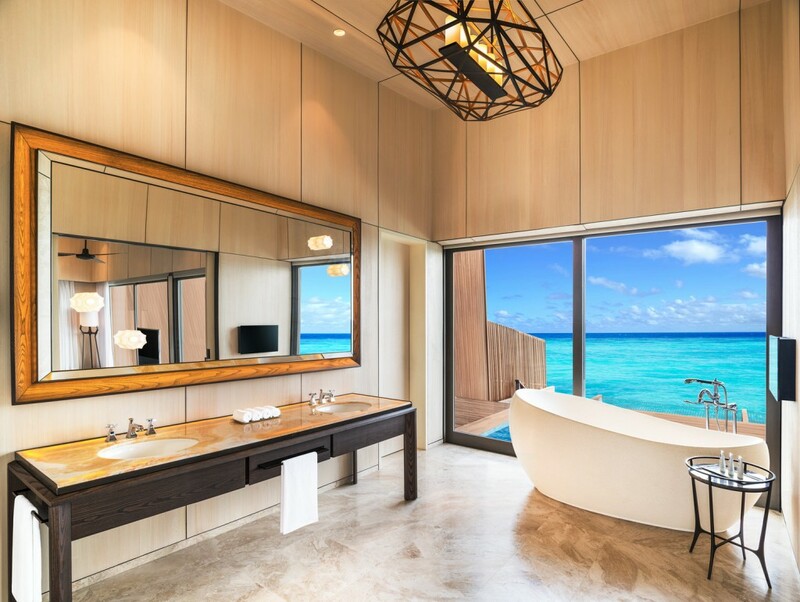 En-suite showers and bathrooms provide unsurpassed privacy and convenience. 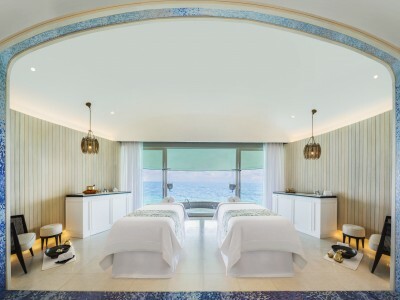 Additional pampering can be found in our spa’s steam rooms, saunas, and cold-drench showers. 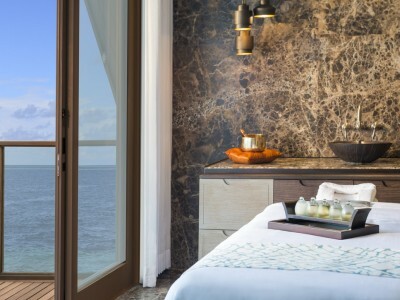 Resort guests receive a complimentary 15-minute Ayurveda consultation. 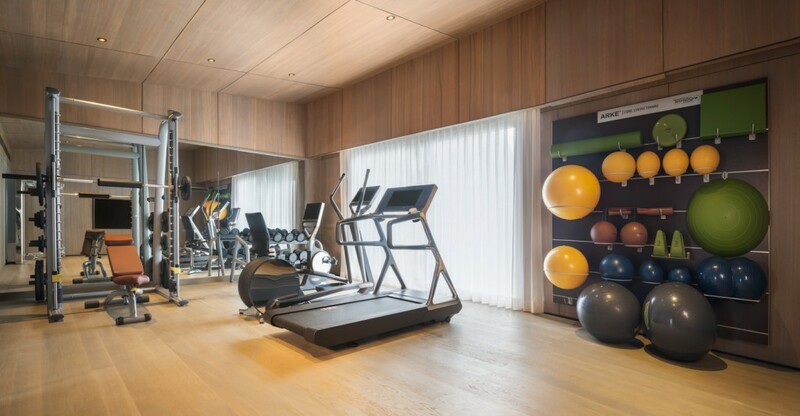 For cardio workouts, amenities include the elliptical, treadmills, recumbent bikes, and cross trainers as well as weights and machines for strength-training. Wi-Fi, personal TVs, and headphones, which are available at the reception desk, provide added convenience. 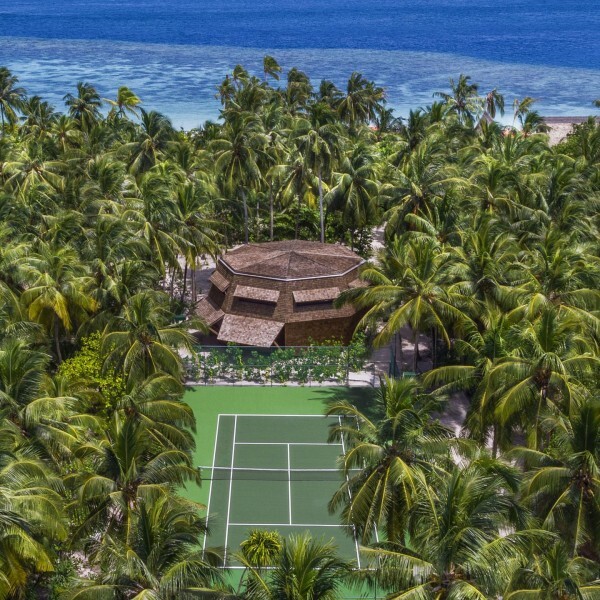 Located in the front of Vommuli House at the very center of the island, the tennis court hosts a Tennis Pro who is pleased to provide tuition along with the necessary equipment such as tennis balls, racquets, and head and wrists bands, among other amenities. 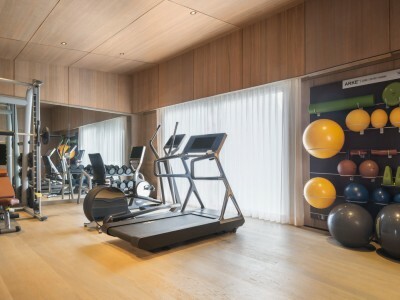 Bottled water and towels are available for added convenience, and the changing rooms are moments away in the Fitness Center. 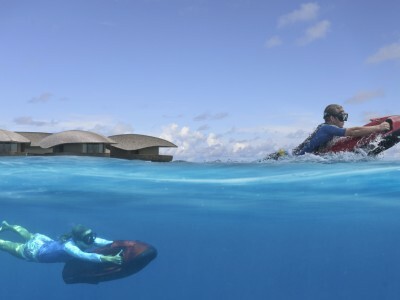 Revel in the natural splendors of island living with a variety of water sports and adventures at your fingertips. 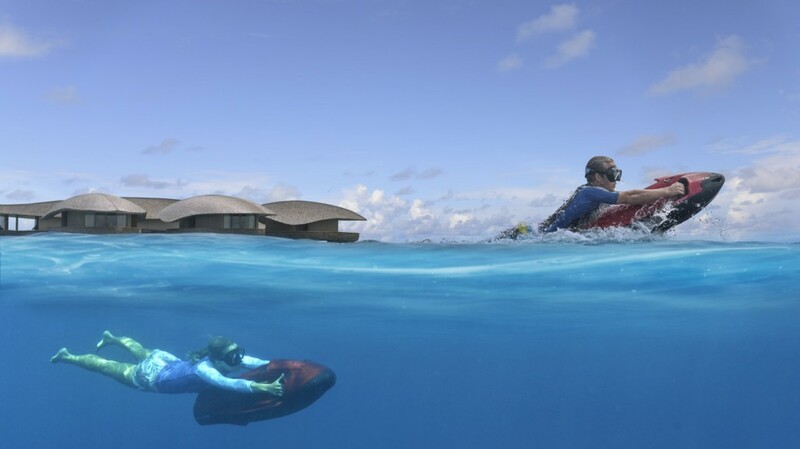 The Vommuli Dive & Watersports Centre provides for any active pursuit whether snorkeling, deep-sea fishing, windsurfing, kayaking, or speed boating. Our fully equipped center, which is recognized as an international dive center by the Professional Association of Diving Instructors (PADI), provides scuba and nitrox diving lessons, certification and expert ScubaPro equipment to ensure safety. 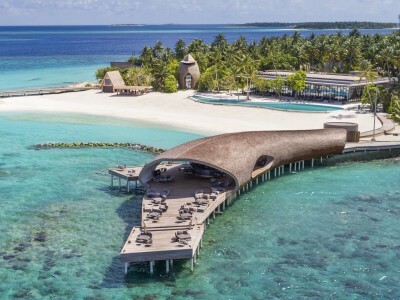 Allow us to assist in organizing any number of excursions such as snorkeling trip, dolphin cruise, sunset fishing, private island picnic and big game fishing. 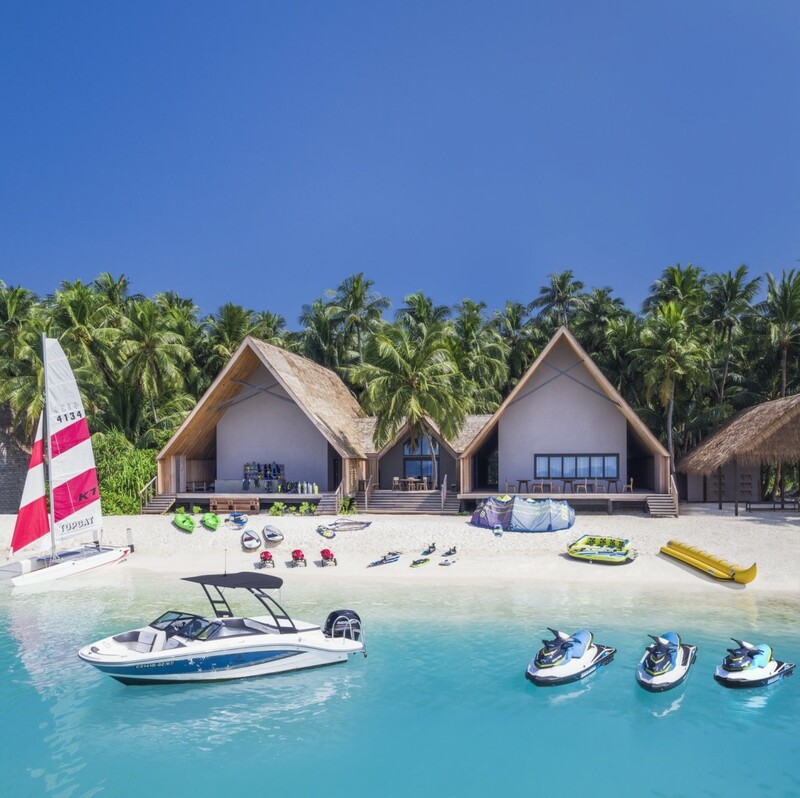 Indulge in various watersports activities including parasailing, jetskiing, kitesurfing, wakeboarding, sea-bob, catamaran sailing and windsurfing. 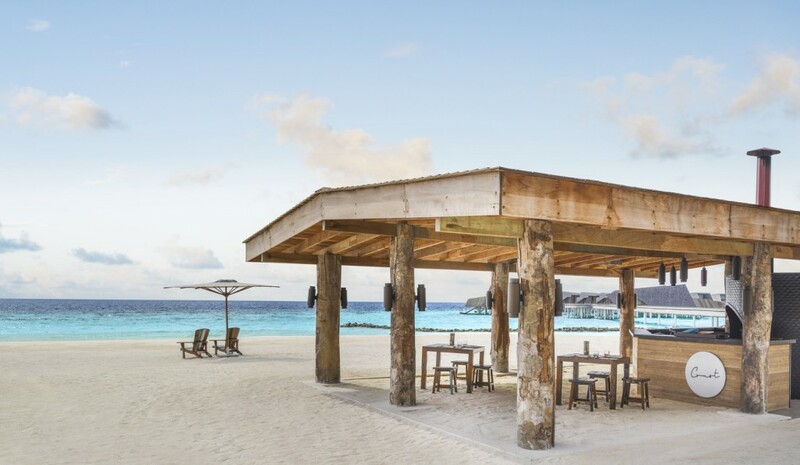 Enjoy complimentary amenities for stand-up paddling and kayak. 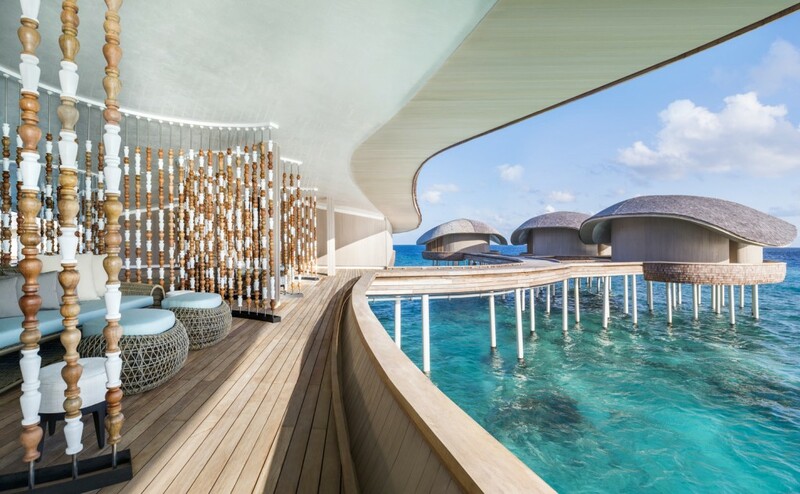 Swim among the eagle rays and vibrantly hued sea life in our private reef and take in the beauty of the Indian Ocean. Our pool and beachfront library includes over 800 book titles from across the globe for guests to peruse and borrow during their time in residence. 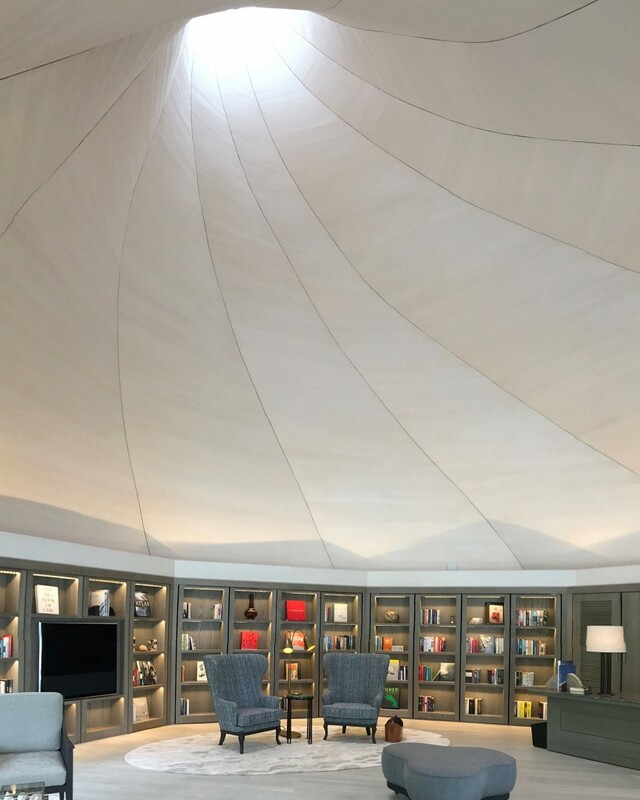 A carefully curated collection of books as well as two fully outfitted workstations with printers allow for productivity, while complimentary faxing and copying is available through the St. Regis Butlers. 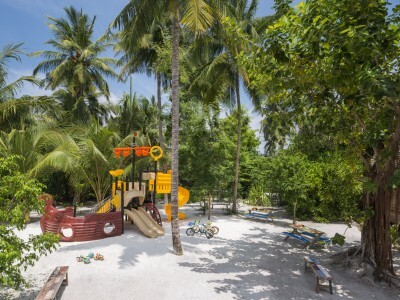 For our youngest guests, our Children’s Club offers a variety of enriching and engaging activities, with our compliments. 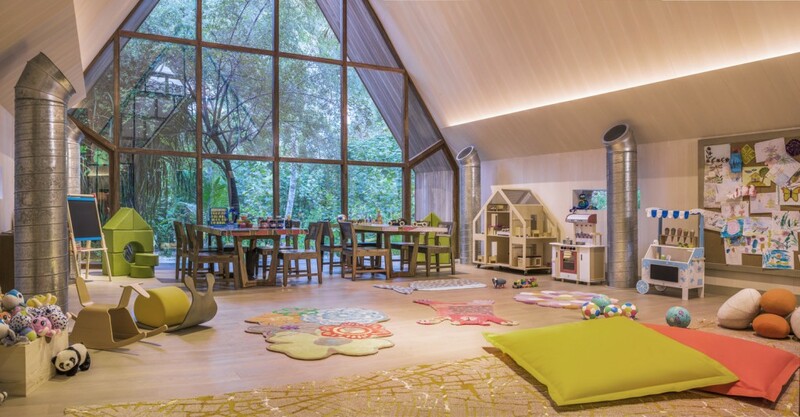 Children aged 4 to 12 may attend a soul-satisfying yoga class complete with meditation, a cooking course in our dedicated children’s kitchen, or take part in creative arts and crafts including origami and painting. 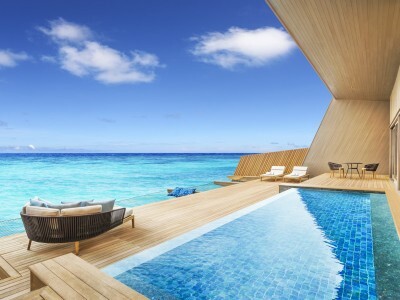 There is also a selection of games, puzzles, and a private dining menu of snacks and juices to enjoy. Experienced childcare attendants will personally monitor the Children’s Club at all times. 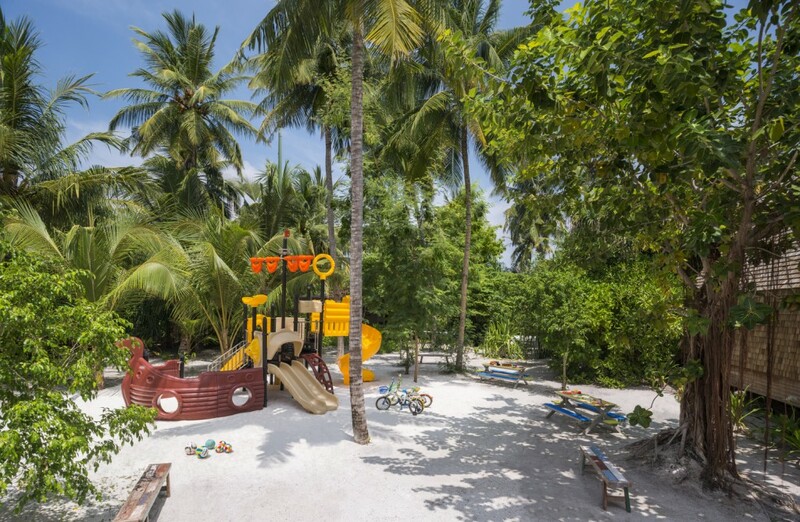 For our young—or young at heart—guests, our open-door recreation area offers myriad amenities to engage in the art of play. Located adjacent to Vommuli House, Socialite welcomes guests aged 16 years and older to take part in a variety of entertainment options including table tennis, foosball, pool, and air hockey as well as video and board games. 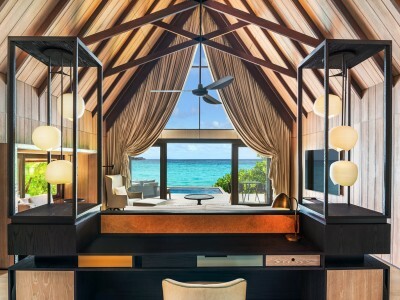 To select a memento of the experiences you have shared and cherished at The St. Regis Maldives Vommuli Resort, step into the St. Regis Boutique. Its first and second floor showcases a collection of elegant jewelry, fashionable clothing, and timeless accessories to choose from. 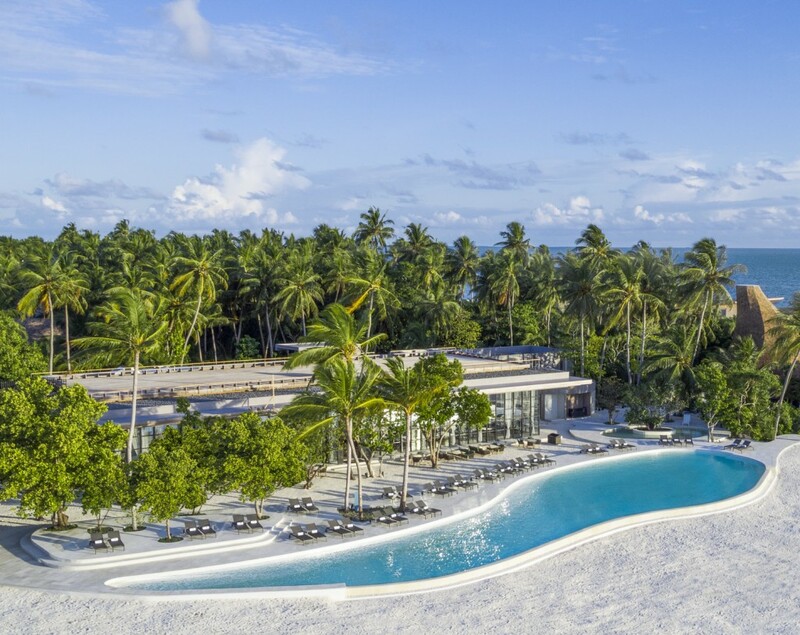 Ascend the spiral staircase to the third floor where the Observatory Tower offers dramatic vistas of the Indian Ocean and swaying palms that dot the island’s shores. 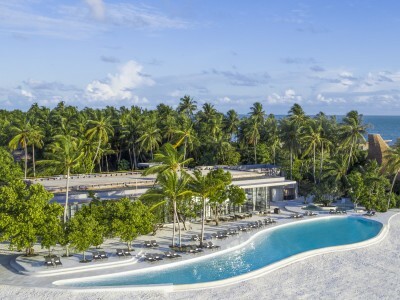 Be the first to review The St. Regis Maldives Vommuli Resort.